This is my 4th time teaching at Scottsdale Artists' School. I had relative large class of 17 people. This first demo is as usual: simple objects, bright center of focus in contrast with dark background. Putting figures into a landscape painting is exciting, but I have not done this much. This demo painting was done with a photo I took a couple of years ago in Xidi China. I thought I might not have enough time to finish, but it turned out all right. I may do more paintings like this in the future. The perspective of this canoe is rather challenge, but I have really enjoyed the graceful curves. I love to paint buildings, you know that. This is a black smith's shop in Louisiana. I took a photo, and did this painting reference to the photo. I feel the color scheme for this painting maybe too cool. 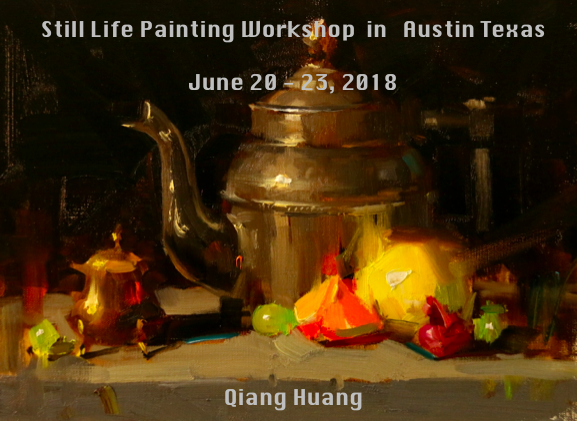 "Still Life Workshop at Austin"
I would like to announce my painting workshops in Austin for 2018. I will teach a 4-day still life workshop on June 20 - 23, and a landscape workshop on November 10 - 12. I have just created a webpage for the June Still Life Workshop. Please check the info and sign up. This is another palm tree demo. I did this at Ponte Vedra Beach Florida. Thanks to so many friends responded to my last post. I understand there are issues we should not openly talk about, but have we noticed those issues are all important issues. Well, let paint more palm trees. because all those trees are supporting each other and forms a beautiful scene, and it helps us to make a beautiful painting.